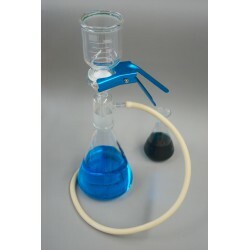 Our filtration accessories can be used with all our filter papers, glass or quartz microfibre filters. Filtration accessories There are 4 products. 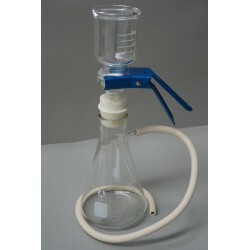 Entirely made with high quality extra hard glass, this apparatus is suitable for removal of particles in solvents and for purification of HPLC solutions. Suitable for membranes of size 47 ou 50 mm. 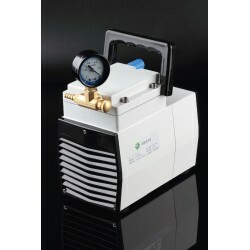 The vacuum pump is made of aluminium alloy and can be used together with a glass solvent filter or with a multiple vacuum filtration system for a more efficient filtration. This filtration system is completely made in SS316L, it is particularly designed for the filtration of several samples at the same time for a more efficient laboratory. Available in 2 versions: 3 branches, 6 branches or 3 branches with manometer. 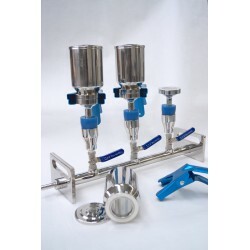 Suitable for membranes or filters of size 47 or 50 mm.